Cargo bikes may look a bit strange but these useful bikes are becoming more common, Cian Ginty reports. A common sight in the Netherlands and Denmark, large cargo bikes are starting to turn heads in Dublin. “It’s in its infancy and there’s only a couple of us who sell them. But the more that the bikes get seen, the more normal they become and then the more popular they become,” says Astrid Fitzpatrick, who runs Dutchbikeshop.ie with her husband Frank. “I’ve already sold more this year so-far than all of last year,” she says. While there’s still only small numbers. Cargo bikes are essential load-carrying bicycles used mostly to transport children and shopping, and used by businesses for deliveries. The Dutch Bike Shop sells a two and three wheeled version Dutch brand Babboe, while Bear Bicycles at Greenaer, based off Pearse Street, sell two-wheeled bikes from another Dutch brand, Bakfiets.nl. One cargo bike that can often be seen in Dublin City Centre is the ‘Bullitt’ by Danish bike builders Larry vs Harry, which is used by bicycle couriers. It’s the racing bike of cargo bike world – it was built to be the fastest and has forward leaning user position compared to the others which hold the typical upright Dutch cyclist position. However Larry vs Harry no longer has an Irish dealer listed on its website. The bicycles used by An Post are a small type of cargo bike, although the difference between it and an average bicycle is far less striking. 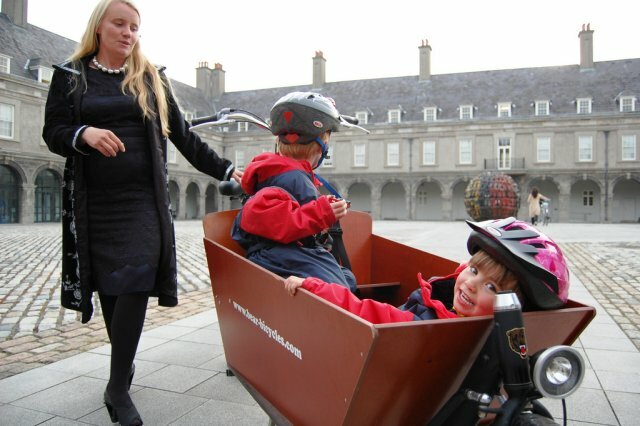 “I’ve on occasion cycled from Lucan to Howth and back,” she adds.The Fitzparticks use one of a Babboe three-wheeled cargo bike to taxi their three children around Lucan, in west Dublin. Emma Tierney, who lives in Blackrock, owns a two-wheeler from Bear Bicycles. “I’ve three kids who are 7, 6, and 3 years old – I take them to school in it and shopping. It’s fantastic, it’s paid for its usefulness at this stage,” she says. Most people who have bought it from her have been using it on a daily basis as a car or second car replacement. “They make a well informed decision before spending money on a cargo bike, it’s not a cheap purchase,” she says. Caitriona Walsh, who also uses a Bear-branded two-wheeler in her business Little Green Fingers, an outdoor childminding service for under preschoolers in Malahide, says she finds the bike easy to use.“The only thing is the kids are getting a little bit big and I live on the top of a hill and on days that are very windy or wet I tend to leave it at home,” adds Emma. “I find it easy to cycle – it’s different, but I find it easy. I really like it and would highly recommend it. The first time you sit on it you say ‘I’ll never be able to do this’ but within seconds you get it. It’s so smooth and well built. It’s better than buying a buggy.” she says. With Little Green Fingers she mostly cycles around parks. She lives close to the grounds of Malahide Castle. “I trained as a Montessori teacher and do some Montessori work with the children but we also go outdoors, identifying wildlife and flowers. We go to the beaches and parks. The children really like it – the uniqueness of the business is that we get outside and they love going on the bike” says Caitriona. She says they had looked at a trailer for a normal bike but went with the cargo bike because the children are so low down in a trailer and with their bike the children are strapped in and in front – so you can see what is going on. What about Irish drivers? Emma says: “The bike is nearly three meters long, so on a couple of occasions I’ve had people trying to overtake as I’m going around the corner not realising that, but I have not had any near misses or anything like that.”Emma also says her children love getting transported in the bike. Rain/wind covers – or ‘tents’ as the makers call them – are available as an extra. There’s a trade off between keeping your children fully covered and adding extra wind resistance. The more agile two-wheeled bikes have pushed cargo bike sales worldwide, but the two or three wheel choice is a personal one based on needs and style. Dublin City Council were looking at electrical assisted cargo bikes to keep deliveries running smoothly to city centre business while the now stalled Metro North and other projects were underway. Do you know what is the model of the child seat shown on the Bullit photo? I think it’s from Larry vs Harry. Mikael Colville-Andersen (of copenhagencyclechic.com etc) was telling me Larry vs Harry had just released them recently. Although no sign of them on larryvsharry.com yet. Cargo bikes are awesome, but the price is a killer. Anyone know if there’s any chance of getting them onto the Dublin Bikes scheme? Rental would make a lot of sense – for taking shopping home, etc. Thanks for the info. Really considering investing in a cargo bike for moving my little family (realising that short trips make up the vast majority of our car trips), and the bullit is really making the top of my shortlist at the moment. Yes cargo bikes are not cheap. But you don’t buy a cargo bike just for fun, rather for a genuine need. If they replace the need for a second car (or a first car for that matter), they turn into a bargain. Also, when you think that so many people are easily willing to spend a thousand euro or more on a buggy, that puts their cost into perspective, especially since the buggy won’t bring you anywhere (and indeed the thousand euro buggy will probably not fit into anything smaller than an SUV :) ). 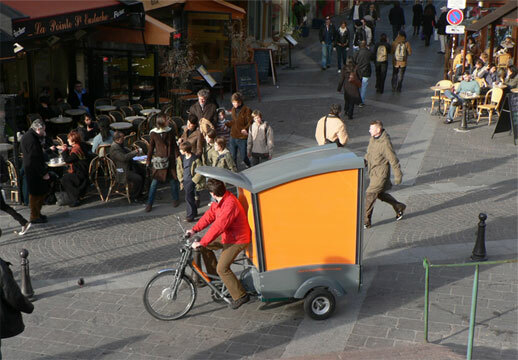 With bike trailers one still keeps a normal bike and can attach the trailer only when needed. The trailer can also be attached to different bikes so that both mom and dad can take their turn. Beware the difference of Holland and the hilly terrain here. I busted my knee several years ago trying to get up a hill with 2 children on trailer, still not great now. Cycled all my life as I am a cloggie myself. Fashion or sense, you decide!